Brazilian artist Marisa Furtado de Oliveira's documentary on the life of Will Eisner has been picked up by Image Entertainment and will be on sale December 16th. Read more at the Image Entertainment page. This page contains a single entry by GaryC published on November 22, 2008 9:51 PM. MTV Splash Page: Eisner's Remembrance was the previous entry in this blog. 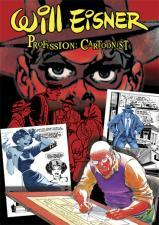 Eisner Awards 2009: call for entries is the next entry in this blog.